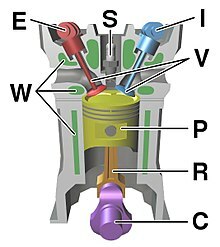 V – valves. reid: exhaust, blue: intake. W – cuiling watter jacket. gray structur – ingine block. An internal combustion ingine (ICE) is a heat ingine whaur the combustion o a fuel occurs wi an oxidizer (uisually air) in a combustion chamber that is an integral pairt o the wirkin fluid flow circuit. This page wis last eeditit on 20 Apryle 2018, at 15:42.